It is not always that excellence will be recognized(unfortunately)…but it feels so right when it does. Congratulations Julia, well deserved! 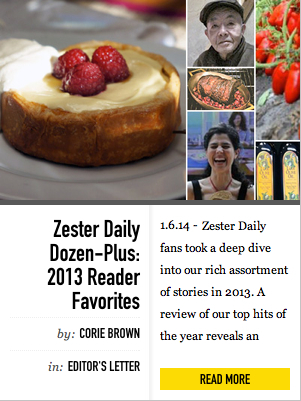 I love to read Zester Daily and your articles are really interesting. Food is not only recipes, food has a history and stories that should be told, and you are a great narrator. I’m a food blogger ( http://zexxyswife.blogspot.ca/ ) and write about authentic world food and would like to dedicate my next post to some unusual charcuterie. One of them is nduja, that I recently found in Little Italy in Vancouver, Canada, where I live. I would be honored to have you as a guest writer, as I know that you would be the best to tell a story about Nduja sausage. Thank you, Sandra. I’m happy to know you are a subscriber. We’ve written to each other before and as you know, I admire your many talents…very nice blog. I’m happy to contribute to it. Let’s be in touch about it.